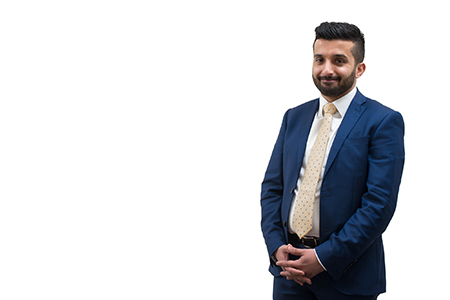 Summary:Maj joined the firm in May 2015 and has progressed to become a Trainee Solicitor currently placed in the Crown Court Department, Luton. Maj’s first Crown Court assignment was to prepare and defend a £160 million pounds Receivables Banking Fraud prosecuted by the Serious Fraud Office. The trial was heard at Southwark Crown Court and lasted for 5 and a half months. Maj was in attendance daily at court and was sat behind one of the country’s leading Queen’s Counsel. Following the conclusion of the trial, Maj was immediately placed behind highly accomplished leading and junior counsel on a £9 million pound Boiler Room Fraud heard before Blackfriars Crown Court. This lasted for just over 3 months. Both cases gave Maj invaluable experience. Maj has also worked in the Magistrates Court Department in Northampton. During his time in Northampton, Maj’s case preparation was key in securing a number of acquittals in the magistrates courts. Maj is also a fully accredited Police Station Representative and can travel nationwide to defend clients in the police station. Maj works particularly well with Youth Defendants as he remembers all too well the folly of his own youth. Outside of work Maj likes to keep fit but is also partial to the odd carb-binge. St Albans Crown Court – R v TG - Youth Murder - 5 youth defendants charged with the murder of a 15 year old youth in Enfield. Luton Crown Court - R v FM – Possession with intent to supply Class A – Police found 33 wraps of Class A drugs, weighing scales and deal bags in client’s bedroom. Client found NOT GUILTY of possession with intent to supply Class A drugs after trial. St Albans Crown Court – R v MA – client charged with Kidnap and Blackmail. Sentencing Guidelines placed him at 6-8 years imprisonment if convicted. On the first day of trial the prosecution offered the lesser offence of Common Assault. The client pleaded guilty and left court with a £300 fine and his life back. Luton Crown Court – R v JM – trial for burglary after client’s blood found on smashed window frame and inside a wall in the house. Client found NOT GUILTY. St Albans Crown Court – R v GB – client charged with Section 18 GBH. After much negotiating outside of court the client was offered the lesser offence of Section 20 GBH. He pleaded guilty and received a Suspended Sentence, keeping him out of prison. R v RD – domestic assault by beating – client acquitted. R v SB – workplace racially aggravated assault by beating – client acquitted. R v SA – racially aggravated assault by beating – client acquitted after Maj spotted in the Unused Material that the complainant did not, when reporting the offence to the police, mention she had been racially abused. It was only 4 days later when the complainant made her statement that she stated she had been racially abused. R v FC – Criminal damage and Possession of Bladed Article – client acquitted. R v TL – Assault by beating – client acquitted.